When Lucy, filthy from cleaning out her fireplace, is sent a crate of apples from her doctor, she takes some around the corner to her hairdresser. She is mistaken for a person named Dirty Gertie by a big-time criminal. He believes she is his good luck charm and gives her a one hundred dollar bill for an apple. Lucy is then enlisted by the police to impersonate Gertie so they can capture the crook. 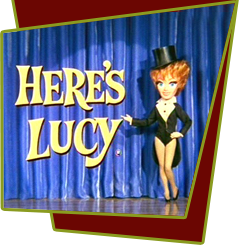 Special Notes: Story line is similar to The Lucy Show, episode #109, "Lucy, the Gun Moll", which was also written by script writer, Bob O'Brien. Bruce Gordon plays the mobster role he played on The Untouchables (1959-63), which was produced by Desilu.